Samatha (Pāli), (Sanskrit: शमथ, śamatha[note 1]) is the Buddhist practice (bhāvanā) of the calming of the mind (citta) and its 'formations' (saṅkhāra). This is done by practicing single-pointed meditation most commonly through mindfulness of breathing. Samatha is common to many Buddhist traditions. It may be accomplished by concentration on a meditation-object. Although seemingly the same as jhana/dhyana, it differs from the practice of jhana/dhyana, which ultimately lead to a heightened awareness. The semantic field of shi and shama is "pacification", "the slowing or cooling down", "rest". The semantic field of né is "to abide or remain" and this is cognate or equivalent with the final syllable of the Sanskrit, thā. The Tibetan term for samatha is shyiné (Wylie: zhi-gnas ). According to Jamgon Kongtrul, the terms refer to "peace" and "pacification" of the mind and the thoughts. In modern Theravada, liberation is thought to be attained by insight into the transitory nature of phenomena. This is accomplished by the establishing of mindfulness, which is then being used for insight (P: vipassanā; S: vipaśyanā) practices, inquiry into the nature of the object, resulting in wisdom (P: paññā, S: prajñā). According to the Theravada tradition, samatha refers to techniques which assist in the calming of the mind. Samatha is thought to be developed by samadhi ("concentration"), which is thought to be the ability to rest the attention on a single object of perception. One of the principal techniques for this purpose is mindfulness of breathing (Pali: ānāpānasati). Although the four jhanas involve a heightened awareness, samatha meditation and jhana are often considered synonymous by the Theravada tradition. Samatha is commonly practiced as a prelude to and in conjunction with wisdom practices. According to the Theravada tradition, mindfulness of breathing leads the practitioner into concentration (samādhi), the domain of experience wherein the senses are subdued and the mind abides in uninterrupted concentration upon the object (i.e., the breath), if not in meditative absorption (Dhyāna). According to the Theravada tradition, it is the condition for insight (vipassanā) and subsequently the development of liberating wisdom (paññā). In Theravada-Buddhism morality (śīla) is understood to be a stable foundation upon which to attain samatha. 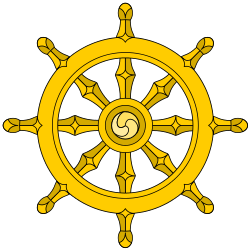 According to the Theravada tradition, samatha and vipassanā form an integral part of the Noble Eightfold Path as described by the Buddha in his core teaching, the Four Noble Truths. Through the meditative development of calm abiding, one is able to suppress the obscuring five hindrances: sensual desire, ill-will, tiredness and sleepiness, excitement and depression, and doubt. With the suppression of these hindrances, the meditative development of insight yields liberating wisdom. Some meditation practices such as contemplation of a kasina object favor the development of samatha, others such as contemplation of the aggregates are conducive to the development of vipassana, while others such as mindfulness of breathing are classically used for developing both mental qualities. In the Theravada tradition there are forty objects of meditation. Mindfulness (sati) of breathing (ānāpāna: ānāpānasati; S. ānāpānasmṛti) is the most common samatha practice. Samatha can include other samādhi practices as well. Theravada Buddhism describes the development of Samatha in terms of three successive mental images or 'signs' (nimitta) and five stages of joy (Pīti). Pīti is a feeling of joy, gladness or rapture arising from the abandonment of the five hindrances in favor of concentration on a single object. These stages are outlined by the Theravada exegete Buddhaghosa in his Visuddhimagga (also in Atthasālinī) and the earlier Upatissa (author of the Vimuttimagga). Suffusing joy (pharana piti) - Pervades the whole body touching every part - signals 'access concentration'. The three nimittas are the preparatory sign, the acquired sign and the counterpart sign. These are certain mental images, perceptions or sensations which indicate a further refinement of the state of meditative awareness. Following the establishment of access concentration (upacāra-samādhi), one can enter the four jhanas, powerful states of joyful absorption in which the entire body is pervaded with Pīti. In Sri Lanka samatha includes all the meditations directed at static objects. In Burma, samatha comprises all concentration practices, aimed at calming the mind. In the last decade samatha in the Burmese tradition has been popularized in the west by Pa Auk Sayadaw. This tradition upholds the emphasis on samatha explicit in the commentarial tradition of the Visuddhimagga. Pa Auk Sayadaw presented this tradition through extensive retreats around the world until his retirement in 2012. In 2005, Tina Rasmussen and Stephen Snyder completed the entire detailed samatha path under Pa Auk Sayadaw's direct supervision. They were subsequently the first Western lay people whom he authorized to teach. The Thai Forest tradition deriving from Ajahn Mun and popularized by Ajahn Chah stresses the inseparability of samatha and vipassana, and the essential necessity of both practices. Vipassanā, insight, which enables one to see, explore and discern "formations" (conditioned phenomena based on the five aggregates). The Buddha is said to have extolled serenity and insight as conduits for attaining the unconditioned state of nibbana (Pāli; Skt. : Nirvana). For example, in the Kimsuka Tree Sutta (SN 35.245), the Buddha provides an elaborate metaphor in which serenity and insight are "the swift pair of messengers" who deliver the message of nibbana via the noble eightfold path. They develop calm abiding and insight in tandem (Pāli: samatha-vipassanam yuganaddham), for instance, obtaining the first jhāna and then seeing in the associated aggregates the three marks of existence before proceeding to the second jhāna. When [the Pāli suttas] depict the Buddha telling his disciples to go meditate, they never quote him as saying 'go do vipassana,' but always 'go do jhana.' And they never equate the word "vipassana" with any mindfulness techniques. In the few instances where they do mention vipassana, they almost always pair it with samatha — not as two alternative methods, but as two qualities of mind that a person may 'gain' or 'be endowed with,' and that should be developed together. Some traditions speak of two types of meditation, insight meditation (vipassana) and calm meditation (samatha). In fact the two are indivisible facets of the same process. Calm is the peaceful happiness born of meditation; insight is the clear understanding born of the same meditation. Calm leads to insight and insight leads to calm." A number of Mahāyāna sūtras address śamatha, usually in conjunction with vipaśyanā. One of the most prominent, the Cloud of Jewels Sutra (Ārya Ratnamegha Sutra, Tib. 'phags-pa dkon-mchog sprin-gyi mdo) divides all forms of meditation into either śamatha or vipaśyanā, defining śamatha as "single-pointed consciousness" and vipaśyanā as "seeing into the nature of things." The Sūtra Unlocking the Mysteries (Samdhinirmocana Sūtra), a yogācāra sūtra, is also often used as a source for teachings on śamatha. The Samādhirāja Sūtra is often cited as an important source for śamatha instructions by the Kagyu tradition, particularly via commentary by Gampopa, although scholar Andrew Skilton, who has studied the Samādhirāja Sūtra extensively, reports that the sūtra itself "contains no significant exposition of either meditational practices or states of mind." Śamatha furthers the right concentration aspect of the noble eightfold path. The successful result of śamatha is also sometimes characterized as meditative absorption (samādhi, ting nge ’dzin) and meditative equipoise (samāhita, mnyam-bzhag), and freedom from the five obstructions (āvaraṇa, sgrib-pa). It may also result in the siddhis of clairvoyance (abhijñā, mgon shes) and magical emanation (nirmāna, sprul pa). Placement of the mind (S. cittasthāpana, Tib. འཇོག་པ - sems ’jog-pa) occurs when the practitioner is able to place their attention on the object of meditation, but is unable to maintain that attention for very long. Distractions, dullness of mind and other hindrances are common. Continuous attention (S. samsthāpana, Tib. རྒྱུན་དུ་འཇོག་པ - rgyun-du ‘jog-pa) occurs when the practitioner experiences moments of continuous attention on the object before becoming distracted. According to B Alan Wallace, this is when you can maintain your attention on the meditation object for about a minute. Repeated attention (S. avasthāpana, Tib. བླན་ཏེ་འཇོག་པ - slan-te ’jog-pa) is when the practitioner's attention is fixed on the object for most of the practice session and she or he is able to immediately realize when she or he has lost their mental hold on the object and is able to restore that attention quickly. Sakyong Mipham Rinpoche suggests that being able to maintain attention for 108 breaths is a good benchmark for when we have reached this stage. Close attention(S. upasthāpana, Tib. ཉེ་བར་འཇོག་པ - nye-bar ’jog-pa) occurs when the practitioner is able to maintain attention throughout the entire meditation session (an hour or more) without losing their mental hold on the meditation object at all. In this stage the practitioner achieves the power of mindfulness. Nevertheless, this stage still contains subtle forms of excitation and dullness or laxity. Tamed attention (S. damana, Tib. དུལ་བར་བྱེད་པ - dul-bar byed-pa), by this stage the practitioner achieves deep tranquility of mind, but must be watchful for subtle forms of laxity or dullness, peaceful states of mind which can be confused for calm abiding. By focusing on the future benefits of gaining Shamatha, the practitioner can uplift (gzengs-bstod) their mind and become more focused and clear. Pacified attention (S. śamana,Tib. ཞི་བར་བྱེད་པ་ - zhi-bar byed-pa) is the stage during which subtle mental dullness or laxity is no longer a great difficulty, but now the practitioner is prone to subtle excitements which arise at the periphery of meditative attention. According to B. Alan Wallace this stage is achieved only after thousands of hours of rigorous training. Fully pacified attention (S. vyupaśamana,Tib. རྣམ་པར་ཞི་བར་བྱེད་པ་ - nye-bar zhi-bar byed-pa), although the practitioner may still experience of subtle excitement or dullness, they are rare and the practitioner can easily recognize and pacify them. Single-pointed attention (S. ekotīkarana,Tib. རྩེ་གཅིག་ཏུ་བྱེད་པ་ - rtse-gcig-tu byed-pa) in this stage the practitioner can reach high levels of concentration with only a slight effort and without being interrupted even by subtle laxity or excitement during the entire meditation session. Attentional Balance (S. samādhāna,Tib. མཉམ་པར་འཇོག་པ་བྱེད་པ་ - mnyam-par ’jog-pa) the meditator now effortlessly reaches absorbed concentration (ting-nge-‘dzin, S. samadhi.) and can maintain it for about four hours without any single interruption. Śamatha, Tib. ཞི་གནས་, shyiné - the culmination, is sometimes listed as a tenth stage. The textual tradition of Tibetan Buddhism identifies five faults and eight antidotes within the practice of śamatha meditation. The five faults identify obstacles to meditation practice, and the eight antidotes are applied to overcome the five faults. This formulation originates with Maitreyanātha's Madhyānta-vibhāga and is elaborated upon in further texts, such as the Stages of Meditation (Bhāvanākrama) by Kamalaśīla. 3. laxity (laya, bying-ba) and excitement (auddhatya, rgod-pa). Laxity may be coarse (audārika, rags-pa) or subtle (sūksma, phra-mo). Lethargy (styāna, rmugs-pa) is often also present, but is said to be less common. In the practice of Mahamudra tranquility meditation ... we treat all thoughts as the same in order to gain sufficient distance and detachment from our current mental state, which will allow us to ease naturally into a state of tranquility without effort or contrivance [...] In order for the mind to settle, we need to suspend the value judgments that we impose on our mental activities [...] it is essential that we not try to create a state of tranquility but allow the mind to enter into tranquility naturally. This is an important notion in the Mahamudra tradition, that of nondoing. We do not do tranquility meditation, we allow tranquility to arise of its own accord, and it will do so only if we stop thinking of the meditative state as a thing that we need to do actively [...] In a manner of speaking, catching yourself in the act of distraction is the true test of tranquility meditation, for what counts is not the ability to prevent thoughts or emotions from arising but the ability to catch ourselves in a particular mental or emotional state. This is the very essence of tranquility meditation [in the context of Mahāmudrā] [...] The Mahamudra style of meditation does not encourage us toward the different levels of meditative concentration traditionally described in the exoteric meditation manuals [...] From the Mahamudra point of view, we should not desire meditative equipoise nor have an aversion to discursive thoughts and conflicting emotions but view both of these states with equanimity. Again, the significant point is not whether meditative equipoise is present but whether we are able to maintain awareness of our mental states. If disturbing thoughts do arise, as they certainly will, we should simply recognize these thoughts and emotions as transient phenomena. For the Kagyupa, in the context of mahāmudrā, śamatha by means of mindfulness of breathing is thought to be the ideal way for the meditator to transition into taking the mind itself as the object of meditation and generating vipaśyanā on that basis. Quite similar is the approach to śamatha found in dzogchen semde (Sanskrit: mahāsandhi cittavarga). In the semde system, śamatha is the first of the four yogas (Tib. naljor, Wylie: rnal-’byor ), the others being vipaśyanā (Wylie: lhag-mthong ), nonduality (advaya, Tib. nyime,Wylie: gnyis-med ), and spontaneous presence (anābogha or nirābogha, Tib. lhundrub, Wylie: lhun-grub ). These parallel the four yogas of mahāmudrā. In June 1996 Ajahn Amaro established Abhayagiri Monastery in Redwood Valley, California, where he was co-abbot with Ajahn Pasanno until July, 2010 Ajahn Amaro returned to Amaravati in July, 2010 and as a longtime student in the Thai Forest Theravādin tradition of Ajahn Chah, has also trained in the dzogchen semde śamatha approach under Tsoknyi Rinpoche. He found similarities in the approaches of the two traditions to śamatha. The ways these two aspects of meditation are practised is that one begins with the practice of shamatha; on the basis of that, it becomes possible to practice vipashyana or lhagthong. Through one's practice of vipashyana being based on and carried on in the midst of shamatha, one eventually ends up practicing a unification [yuganaddha] of shamatha and vipashyana. The unification leads to a very clear and direct experience of the nature of all things. This brings one very close to what is called the absolute truth. Meditations from other religious traditions may also be recognized as samatha meditation, that differ in the focus of concentration. In this sense, samatha is not a strictly Buddhist meditation. Samatha in its single-pointed focus and concentration of mind is cognate with the sixth "limb" of aṣṭanga yoga', rāja yoga which is concentration (dhāraṇā). For further discussion, see the Yoga Sūtras of Patañjali. ↑ Also romanized to shamatha, Tib. ཞི་གནས་, shyiné; Wylie: zhi gnas ; English: "calm" or "tranquility"
↑ A 2008 book by Richard Shankman entitled The Experience of Samadhi: An In-depth Exploration of Buddhist Meditation comparatively surveys the treatment of samatha in the suttas, in the commentarial tradition of the Visuddhimagga, and among a number of prominent contemporary Theravāda teachers of various orientations. ↑ Asaṅga delineates the nine mental abidings in his Abhidharmasamuccaya and the Śrāvakabhūmi chapter of his Yogācārabhūmi-śāstra. It is also found in the Mahāyānasūtrālaṅkāra of Maitreyanātha. ↑ Ray, Reginald A. (Ed.)(2004). In the Presence of Masters: Wisdom from 30 Contemporary Tibetan Buddhist Teachers. Boston, Massachusetts, USA: Shambhala. ISBN 1-57062-849-1 (pbk. : alk. paper) p.69. ↑ Ray, Reginald A. (Ed.)(2004). In the Presence of Masters: Wisdom from 30 Contemporary Tibetan Buddhist Teachers. Boston, Massachusetts, USA: Shambhala. ISBN 1-57062-849-1 (pbk. : alk. paper) p.70. ↑ Ray, Reginald A. (Ed.)(2004). In the Presence of Masters: Wisdom from 30 Contemporary Tibetan Buddhist Teachers. Boston, Massachusetts, USA: Shambhala Publications. ISBN 1-57062-849-1 (pbk. : alk. paper) p.69. ↑ See, for instance, AN 2.30 in Bodhi (2005), pp. 267-68, and Thanissaro (1998e). ↑ See, for instance, Bodhi (1999) and Nyanaponika (1996), p. 108. ↑ These definitions of samatha and vipassana are based on the Four Kinds of Persons Sutta (AN 4.94). This article's text is primarily based on Bodhi (2005), pp. 269-70, 440 n. 13. See also Thanissaro (1998d). ↑ Bodhi (2000), pp. 1251-53. See also Thanissaro (1998c) (where this sutta is identified as SN 35.204). See also, for instance, a discourse (Pāli: sutta) entitled "Serenity and Insight" (SN 43.2), where the Buddha states: "And what, bhikkhus, is the path leading to the unconditioned? Serenity and insight...." (Bodhi, 2000, pp. 1372-73). ↑ While the Nikayas identify that the pursuit of vipassana can precede the pursuit of samatha, a fruitful vipassana-oriented practice must still be based upon the achievement of stabilizing "access concentration" (Pāli: upacara samādhi). ↑ Bodhi (2005), pp. 268, 439 nn. 7, 9, 10. See also Thanissaro (1998f). ↑ Brahm (2006). Mindfulness, Bliss, and Beyond. Wisdom Publications, Inc. p. 25. ISBN 0-86171-275-7. ↑ Yates, Culadasa John; Immergut, Matthew; Graves, Jeremy (2015-10-06). The Mind Illuminated: A Complete Meditation Guide Integrating Buddhist Wisdom and Brain Science. Dharma Treasure Press. ↑ Ajahn Chah's 'View of the View'", in Broad View, Boundless Heart by Ajahn Amaro. ↑ Ray, Reginald A. (Ed.)(2004). In the Presence of Masters: Wisdom from 30 Contemporary Tibetan Buddhist Teachers. Boston, Massachusetts, USA: Shambala. ISBN 1-57062-849-1 (pbk. : alk. paper) p.76.